“I think the best part of my job is seeing those kids go home with a happy smile and know that they succeeded for the day,” says North Dakota United’s Education Support Professional of the Year Denbea McNally. Those are the words of Denbea McNally, North Dakota United’s 2019 Education Support Professional of the Year. But don’t be fooled. A lot happens during the day to help those kids go home with smiles. And Denbea’s a big part of it. If you aren’t familiar with the works paras do in schools and classrooms all over the state, listen to a portion of McNally’s work day. “This year I’m a one on one the last two years I traveled from a kindergarten class to a first-grade class to third-grade class to a fifth-grade class I mean I think I had thirteen alarms on my phone so I knew exactly where I needed to be because I traveled throughout the school. This year I happen to be a one on one with this certain child which is wonderful,” McNally said. McNally hasn’t even mentioned helping kids get on the bus, lunch duty, gym or recess with all 110 kindergartners. She did mention working one on one. This year, she’s a para in Amy Neal’s kindergarten class at Lewis and Clark Elementary working with Noah. Each day comes with its challenges, failures, and successes. “And knowing that he’s succeeding and the love that he shows you and the love that you can give back is just so rewarding and priceless. It’s just words … I say you can’t explain it in words; it really is emotional some days, because you go home and say, ‘It was a great day. Today was a great day,'” McNally said. Neal, the 2016 North Dakota Teacher of the Year, says paraprofessionals teach things like social skills and acceptance. The most important thing they do? “They allow the teacher, which would be myself, to pull off a full lesson. 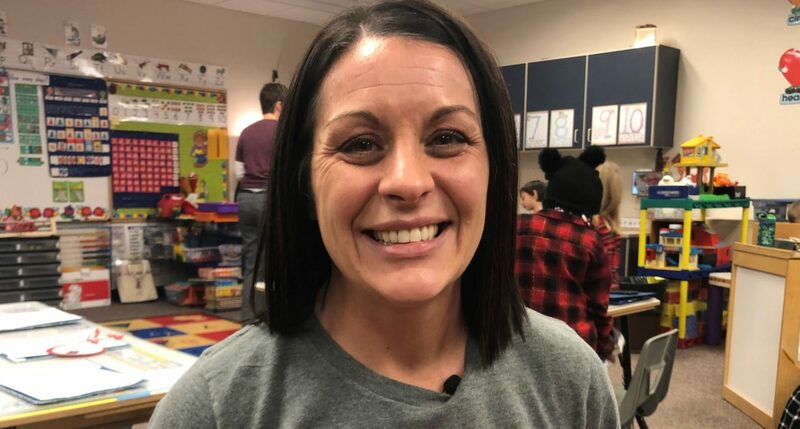 If there is a child in the classroom that needs particular help because of a special need, or if there are multiple kids that may need some little interventions that para is allowing me to fulfill the needs of the other students and my lesson continues and they continue learning,” Amy Neal said. McNally, who said she wondered what she was getting herself into at the start of her para career, now says she can’t imagine doing anything else. “I think the best day at work is when those kids come and give you a hug, and they’re like, ‘I can’t wait to see you tomorrow, Miss McNally.’ Or if you’re gone for the day and you come back the next day, they’re like, ‘Oh, we missed you, Miss McNally, we missed you, Miss Denbea.’ Just knowing that you make their day is the only word that you need at school. It’s just knowing you’re coming here for those kids and they look forward to seeing you,” McNally said. Story, video and photos by Tom Gerhardt, North Dakota United Communications.